Tens of thousands of wind turbines have been installed in areas that are considered critical to migratory and threatened birds and that number is set to more than double in the future. An analysis by the American Bird Conservancy (ABC) shows that more than 30,000 turbines overlap with federally protected bird habitat, including 24,000 in the migratory corridor of the whooping crane and 3,000 in breeding grounds of the endangered Greater Sage-Grouse. 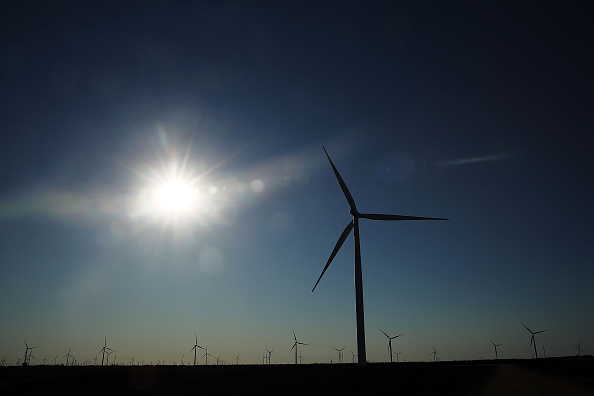 More than 50,000 additional turbines are planned for construction, the group said. "Wind turbines are among the fastest-growing threats to our nation's birds," said Dr. Michael Hutchins, Director of ABC's Bird Smart Wind Energy Campaign. "Attempts to manage the wind industry with voluntary as opposed to mandatory permitting guidelines are clearly not working. Wind developers are siting turbines in areas of vital importance to birds and other wildlife, and this new data shows that the current voluntary system needs to be replaced with a mandatory permitting system." Wind power has grown significantly since 2008, driving more than $100 billion in private investment and expectations are that it will continue growing. A U.S. Department of Energy report projected wind energy could double within the next five years to supply 10 percent of U.S. electricity by 2020, 20 percent by 2030 and 35 percent by 2050. But with that growth has come fears of bird deaths. By 2030, ABC estimated that wind turbines could kill more than 1.4 million birds annually, not including losses at associated transmission lines and towers. Tom Vinson, the American Wind Energy Association vice president for federal regulatory affairs, questioned the findings. He said using FAA data to project the number of turbines to be built was "meaningless," since it was hard to predict how many would get constructed and stated with certainty that the ABC report overestimated the number. "Projects will get cancelled for any number of reasons: wildlife issues, inability to find a purchaser for the power, DOD or FAA concerns, costs that are too high for transmission interconnection, inability to secure enough land agreements, among other issues," he said. Vinson also argued that bird deaths from wind turbines were far less than other threats, including oil waste pits, windows and buildings. Concerns about rising death rates prompted ABC to lobby the federal government to increases its oversight of the wind industry with regard to bird impacts. It also joined 70 conservation organizations in an unsuccessful attempt to get the U.S. Department of Interior develop a National Programmatic Wind Environmental Impact Statement, which would identify appropriate areas for wind energy development, as well as areas where development should be avoided. While insisting it supports renewables including wind power, ABC said there are ways it could be done with the safety of birds in mind. It called for, among other things, "effective mitigation" to minimize bird impacts and "independent, transparent post-construction monitoring to help inform mitigation, and calculate compensation for the loss of ecologically-important, federally protected birds." "We can and must do better if future generations of Americans are going to have a chance to see some of our nation's most iconic bird species," Hutchins said. "Our nation's wildlife should not be collateral damage in the battle against climate change, especially when much of the conflict could be easily addressed through better siting of wind projects and improved regulation."